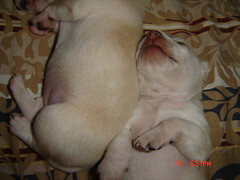 Snoozing Puppies » Blog Archive » How are we supposed to sleep on a pattern this loud? This entry was posted on Tuesday, December 18th, 2007 at 6:28 am	and is filed under dreamy. You can follow any responses to this entry through the RSS 2.0 feed. You can leave a response, or trackback from your own site. I am a huge fan of Robby Gordon. I feelthat Nascar wasn’t fair to him. He didn’t do anyithng wrong. Ambrose came up to him and deliberately pushed Robby out of the way. Robby was in front of Ambrose at the time the caution flag came out. Ambrose knew Robby took the lead, so he was jealous, and pushed Robby out of the way to try to get in front of him.How childish of Ambrose because Ambrose started it.Ambrose should have been punished notRobby, but what happened Robby was punished and Ambrose wasn’t how fair is that it wasn’t fair. Most of the driver’s would have reacted in the same way. Nascar made their decision on impulse they should have took time to view the tape, then they would have seen who was at fault and it wasn’t Robby. Robby won the race not Harvick.